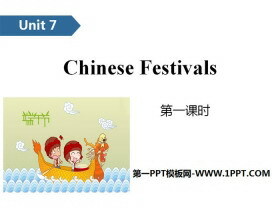 《Brithdays》PPT(第二课时) 第一部分内容：Introduce --Whens Christmas? --Its on the twenty-fifth of December. 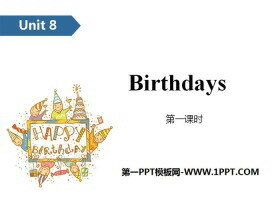 ... ... ... BrithdaysPPT，第二部分内容：Words work [w:k] 动词，意为工作。作名词，意为工作。 eg：It is..
《Brithdays》PPT(第一课时) 第一部分内容：Introduce --Whens your birthday ? 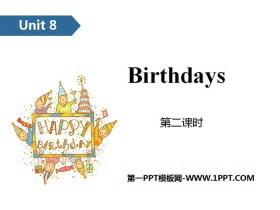 --Its on the ...of... ... ... ... BrithdaysPPT，第二部分内容：Words your [j:] 形容词性物主代词，后接名词，意为你的...。 eg：This is you..
《Chinese festivals》PPT(第一课时) 第一部分内容：Introduce A: Which one do you like? B: I like meat. C: I like fish. 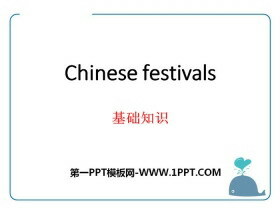 ... ... ... Chinese festivalsPPT，第二部分内容：Words or [:, ] 连词，意为或者，或;用于否定句..
《Chinese festivals》基础知识PPT 第一部分内容：重点单词 1.festival 节日 2.January 一月 3.February 二月 4.call 叫作，称作 5.dumpling 饺子 6.May 五月 7.June 六月 8.place 地方，地点 9.September 九月 10.October 十..
《In the kitchen》PPT(第二课时) 第一部分内容：Introduce What is Liutaos father cooking? Hows the meat? What is his mother cooking? How is the soup? ... ... ... 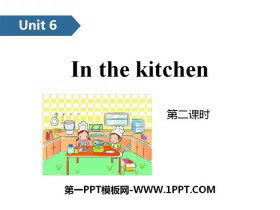 In the kitchenPPT，第二部分内容：Words quick [kwik..
《In the kitchen》PPT(第一课时) 第一部分内容：Introduce --Is there any... --Yes, it is. / No, it isnt. --How is...? --Its Yummy / nice. ... ... ... 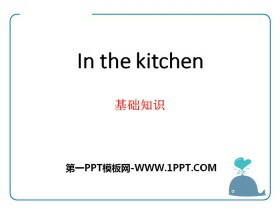 In the kitchenPPT，第二部分内容：Words some [sm, sm] 形容词，..
《In the kitchen》基础知识PPT 第一部分内容：重点单词 1.game 运动，比赛 2.smell 有气味，闻起来 3.meat (猪、牛、羊等的)肉 4.vegetable 蔬菜 5.tomato 西红柿，番茄 6.potato 马铃薯，土豆 7.ready 准备好 8.yummy 好吃的..
《Helping our parents》PPT(第二课时) 第一部分内容：Introduce --What is she doing? --She is jumping. --What are they doing? --They are playing basketball. ... ... ... 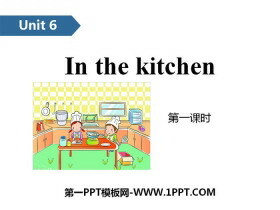 Helping our parentsPPT，第二部分内容：Words ..
《Helping our parents》PPT(第一课时) 第一部分内容：Introduce --What is he doing? --He is playing basketball. --What are they doing? --They are doing homework. ... ... ... 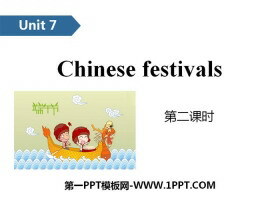 Helping our parentsPPT，第二部分内容：W..
《Helping our parents》基础知识PPT 第一部分内容：重点单词 1.parent 父或母 2.clean 擦，洗 3.cook 烧，煮 4.busy 忙，忙碌 5.grow 种植 6.garden 花园，果园 7.sweet 甜的 8.pest 害虫 9.ladybird 瓢虫 ... ... ... Helpin..